Background/Aim Aggressive ski-snow interaction is characterised by direct force transmission and difficulty of getting the ski off its edge once the ski is carving. This behaviour has been suggested to be a main contributor to severe knee injuries in giant slalom (GS). The aim of the current study was to provide a foundation for new equipment specifications in GS by considering two perspectives: Reducing the ski's aggressiveness for injury prevention and maintaining the external attractiveness of a ski racer's technique for spectators. Methods Three GS ski prototypes were defined based on theoretical considerations and were compared to a reference ski (Pref). Compared to Pref, all prototypes were constructed with reduced profile width and increased ski length. The construction radius (sidecut radius) of Pref was ≥27 m and was increased for the prototypes: 30 m (P30), 35 m (P35), and 40 m (P40). Seven World Cup level athletes performed GS runs on each of the three prototypes and Pref. 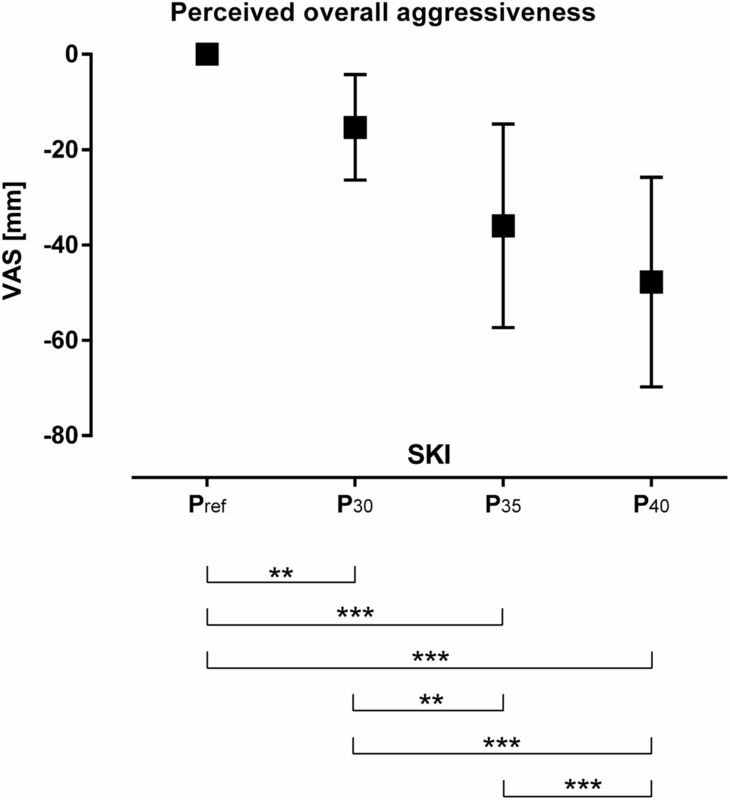 Kinetic variables related to the ski-snow interaction were assessed to quantify the ski's aggressiveness. Additionally, 13 athletes evaluated their subjective perception of aggressiveness. 15 sports students rated several videotaped runs to assess external attractiveness. Results Kinetic variables quantifying the ski's aggressiveness showed decreased values for P35 and P40 compared to Pref and P30. Greater sidecut radius reduced subjectively perceived aggressiveness. External attractiveness was reduced for P40 only. Conclusions This investigation revealed the following evaluation of the prototypes concerning injury prevention and external attractiveness: P30: no preventative gain, no loss in attractiveness; P35: substantial preventative gain, no significant loss in attractiveness; P40: highest preventative gain, significant loss in attractiveness. According to the perception of expert stakeholders of the World Cup ski racing community, aggressive ski behaviour is one of the main contributors to the aforementioned injury mechanism.6 ,8 Aggressive ski behaviour is characterised by a too direct force transmission between ski and snow and the phenomenon that the ski becomes difficult to get off its edge once it is carving. As a result, the athlete is unable to control the ski in the event of an out-of-balance situation because due to its self-steering effect, the ski's behaviour becomes unpredictable.8 Consequently, it seems reasonable to assume that aggressive ski behaviour favours the ‘catch of the edge’ in an out-of-balance situation.8 Less aggressive skis (eg, ones with a greater turning radius), however, are theoretically associated with a decreased self-steering effect, which might affect their performance during controlled skiing (ie, not out-of-balance situations).14 ,15 One could presume that less aggressive skis require a different technique to make them turn and this could potentially result in decreased attractiveness for competitors and spectators. Therefore, the aim of this study was to provide the decision makers of FIS with an evidence-based foundation for equipment specification changes in giant slalom (GS) by verifying the achievability of the following goal: GS specific injury prevention by a reduction of the ski's aggressiveness, and maintaining the external attractiveness of ski technique to spectators. In a first step, prototypes were determined, constructed and subsequently analysed. An expert group consisting of researchers, FIS Race Directors and representatives of the Ski Racing Suppliers Association (SRS) defined the prototypes by considering practical and existing scientific knowledge. The geometrical factors ‘sidecut radius’, ‘ski width’ and ‘ski length’ as well as the mechanical properties ‘homogenous bending line’ and ‘torsional stiffness’ were assumed to be the driving factors for aggressive ski behaviour.6 ,15 The ski's self-steering effect was assumed to be mainly dependent on the sidecut radius and the ski's bending characteristics.14 However, not every technical solution that could potentially reduce the ski's aggressiveness was viable. Constructive and commercial considerations of SRS, as well as limitations with respect to an appropriate execution of the rules after the competition by FIS lead to certain constraints. Considering these constraints, only three basic geometric variables (length, width and sidecut radius)16–18 were altered and experimentally tested as depicted in table 1. All prototypes were constructed under the guidance of SRS, strictly adhered to by predefined geometrical variables and material composition. Four companies (Atomic, Fischer, Head, Rossignol) produced a full set of prototypes. The corresponding reference skis (Pref) represented the competition equipment used at the time of this study. Compared to Pref, all prototypes (P30; P35; P40) had reduced profile width under the binding (ski width) and increased ski length. The sidecut radius, representing the main self-steering effect related variable,14 was increased (table 1). The increased sidecut radius in combination with reduced width under the binding results by definition in reduced profile width among the entire ski compared to Pref. Thirteen elite male alpine athletes (Europa-Cup and World-Cup level) participated in this study. To familiarise them with the prototypes, several free skiing and GS training sessions were performed prior to the experiment. 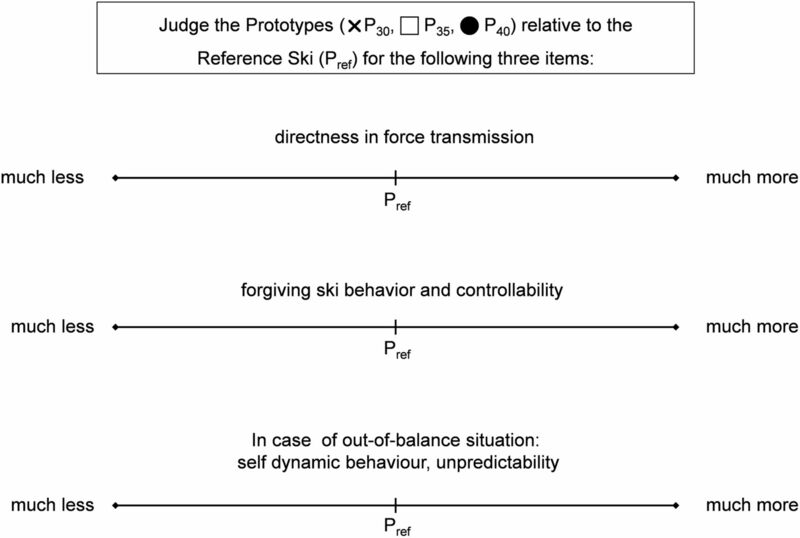 After participating in a biomechanical experiment, they were asked to complete a visual analogue scale (VAS) sheet to assess the subjectively perceived aggressiveness in relation to Pref when skiing with the prototypes (figure 1). Visual analogue scale (VAS) to assess perceived equipment aggressiveness. The ski's aggressiveness is known to manifest in different features of the ski-snow interaction.6 ,8 An overall score was calculated as a mean of these three resulting features of aggressive behaviour, without directly asking for aggressiveness (mean of three VAS values). The significance of differences for the ‘overall aggressiveness score’ were tested with a one-way repeated measures analysis of variance(ANOVA) (Pref/P30/P35/P40; p<0.05). In case of significance, post hoc testing was performed (Bonferroni). The above described statistical procedure was further applied to the score distance (difference) of two adjacent ski geometries (Pref↔P30/P30↔P35/P35↔P40). Seven male World-Cup level athletes participated in this study. The athletes performed three runs with each ski on a typical GS course (18 gait, water-injected), whereby the two fastest runs were considered for analysis. The analysed section consisted of 8 gates, resulting in 16 turns per athlete and condition (total turn number=448). The approach used to biomechanically quantify aggressive ski behaviour is based on the following considerations: Snow penetration-, shear-, and friction forces push against the running surface of an edged ski and force the ski into a traverse, which makes the skier turn.19 Specifically: the forebody of a ski generates a groove into the snow by shearing and penetrating the snow.20 ,21 This results in friction at the forebody of the ski. Along with the inertia of the skier, this also results in loading at the interface of ski and skier (ie, contact area of forefoot and equipment). The deeper the reverse camber (by sidecut radius and/or edge angle), the faster the ski will turn due to the more pronounced self-steering effect14 ,15 and results in a more evident loading at where forces are transmitted in and between equipment and skier. Therefore, measuring ground reaction forces for quantifying aggressive ski behaviour would seem to be reasonable. For the current study pressure insoles were used to quantify local loads between the foot and the ski boot (PEDAR; Novel; 100 Hz). Based on the pressure values the following forces were calculated relative to body weight (BW) (figure 2): Total ground reaction force (Ftot), ground reaction force of the outside leg (Fout), and the Fout portion at the forefoot (Foutfor) and rearfoot (Foutaft). The pressure insoles used are known to underestimate the real force values.22 Nevertheless, for a dependent (ie, different ski's) study design with high level athletes, the applied method can be considered adequate, since it minimally impairs the athletes during movement execution and, additionally, the areas of force transmission can be depicted. Turn separation was performed based on the functional minima of Ftot during edge change.23 Time-normalised data were subsequently divided into four phases based on previously reported kinematic data in GS: 0–23% Initiation; 23–52% COM Direction Change I; 52–82% COM Direction Change II; 82–100% Completion.12 ,24 Parameter calculation and post-processing were performed using MATLAB R2012b (MathWorks). Top: Athlete performing a turn to the left during the experiment. In this case, the right leg represents the ‘Outside Leg’ (out) and the left leg the ‘Inside Leg’ (ins). Bottom: Sensor definition for calculating the selected ground reaction force parameters→ Total (Ftot); Outside Leg (Fout); portion of Fout at the forefoot (Foutfor); portion of Fout at the rearfoot (Foutaft). For each athlete and condition, average curves were calculated. Based on these individual average curves, group mean values along the overall turn pathway were calculated and graphically visualised as average curve±SE. The mean values of the specific turn phases were reported as mean±SD and were tested for significant differences (p<0.05). For each turn phase, repeated measures multivariate ANOVA (MANOVA) (dependent Ftot/Fout/Foutfor/Foutaft; independent Pref/P30/P35/P40) were calculated. In case of global significance, a one-way repeated measures ANOVA (Pref/P30/P35/P40) was performed on each variable, including post hoc testing with Bonferroni correction. Furthermore, ANOVA with post hoc testing was applied on the distance (difference) of two adjacent ski geometries (Pref↔P30/P30↔P35/P35↔P40). Twenty sports students regularly following GS events on TV participated in this study. A set of 28 videos conducted during the biomechanical experiment; 5 gate section; n=7×(Pref+ P30+P35+P40) were presented to the participants several times: Session1 and Session2 were used to prime the participants with respect to the spectrum of the 28 videos. During Session3 and Session4, participants rated the randomised video via VAS (figure 3). Each video was presented three times (original speed; reduced speed; original speed) with a subsequent rating period of 15 s. Within Session 3 and Session 4, a break of 5 min was permitted, and between the sessions a break of 15 min was given. Visual analogue scale (VAS) to assess external attractiveness. To evaluate the rater reliability of participants, individual correlations on the 28 VAS values between Session3 and Session4 were calculated, which resulted in the exclusion of five participants with r<0.7. The VAS values from the remaining 15 participants were finally tested for statistical differences (Session3). The significance of the VAS value on external attractiveness was tested with a two-way repeated measures ANOVA (4 (Pref/P30/P35/P40)×7 (athletes); p<0.05) including post hoc analysis with Bonferroni correction. The ANOVA and all pairwise comparisons revealed significant differences in the overall aggressiveness scores (figure 4). The VAS scores decreased with greater sidecut radius (Pref>P30>P35>P40). The perceived aggressiveness decreased almost linearly with sidecut radius increase, so the score distances between two adjacent ski geometries did not reveal significant differences (p>0.175; ηp2=0.272). Mean±SD of the perceived aggressiveness for the four ski conditions (n=13). The negative value represents a decrease in aggressiveness score compared to Pref. Bars across indicate significant differences (*p<0.05, **p<0.01, ***p<0.001). The time-courses of ground reaction force for the four ski sample are presented in figure 5. Generally, all ground reaction force parameters decreased with greater sidecut radius, especially in the phases after gate passage. This observation is supported by the MANOVA results for the specific turn phases: no significance for Initiation (p<0.225, ηp2=0.201) and COM Direction Change I (p<0.078, ηp2=0.245); but significance for COM Direction Change II (p<0.022, ηp2=0.331); and Completion (p<0.014, ηp2=0.349). Areas of uncertainty around the estimate of the mean (±SE) illustrating the occurring ground reaction forces (Ftot, Fout, Foutfor and Foutaft defined in figure 2) over one turn cycle (n=7); from black to light grey correspond to the following skis: black ≙ Pref → P30 → P35 → P40 ≙ light grey. Vertical dotted lines separate the specific turn phases. During COM Direction Change II the subsequent ANOVÀs revealed significant differences for Ftot, Fout and Foutfore, but not for Foutaft (table 2). Post hoc comparison did not reveal significant differences between Pref and P30 and between P35 and P40 for any parameter. From all other pairwise comparisons, greatest differences were observed for Foutfore (from −11.2% up to −17.2%; table 2). For this parameter, the distances of two adjacent ski geometries also were significant (p<0.028, η=0.831): Pref↔P30 (0.02BW±0.04) is significantly smaller (p<0.042) compared to P30↔P35 (0.11BW±0.04); P30↔P35 is significantly greater (p<0.048) compared to P35↔P40 (0.03BW±0.02); no significant difference between Pref↔P30 and P35↔P40. The two-way ANOVA and some of the post hoc analyses revealed significant differences for external attractiveness (figure 6). For the factor ski, no differences were found for Pref, P30 and P35. P40, however, was significantly less attractive compared to all other skis. 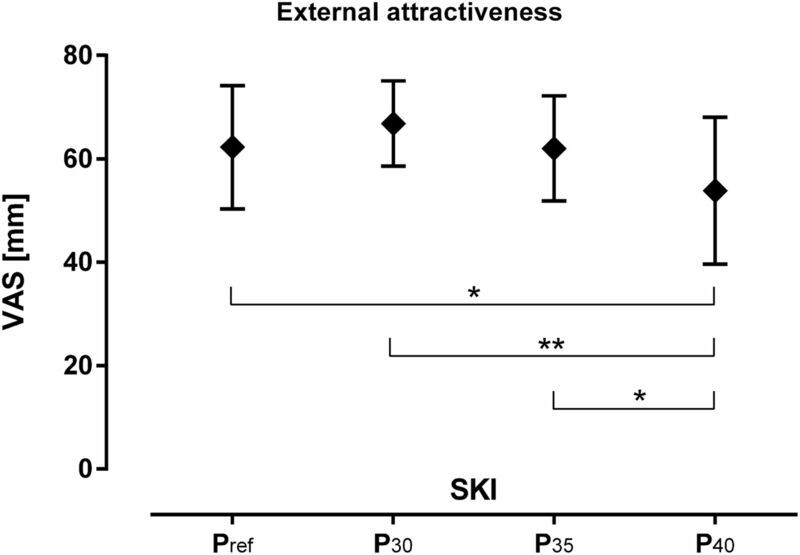 Mean±SD of the external attractiveness values for the four ski conditions (n=15). Bars across indicate significant differences (*p<0.05, **p<0.01, ***p<0.001). The main findings of this study were: (1) a combination of small alterations in ski length, ski width and sidecut radius (Pref vs P30) was found to lead to an altered perception of the ski's aggressiveness, but not to a significant decrease in the biomechanically quantified aggressiveness; (2) a substantially greater sidecut radius (35m and 40m) led to a decrease in the perception of the ski's aggressiveness accompanied by a reduction of ground reaction force after gate passage, particularly under the forefoot of the outside leg; (3) the forces acting under the forefoot did not decrease linearly with greater sidecut radius (P30↔P35>P35↔P40); (4) external attractiveness was significantly decreased only when skiing with P40. The sidecut radius is one of the most important variables of ski geometry because it largely determines how a ski turns.15 ,27 To some extent, this was verified by this study as well, since the intervention according to ski width and ski length (P30) did not reveal significant differences with respect to the biomechanical measures compared to Pref. As a ski is tipped up on its edge and pressed against the snow surface, the sidecut radius allows the ski into a reverse camber position and makes the ski turn as it moves forward. This is called the ski's self-steering effect.14 In the context of injury mechanisms, this behaviour is also of interest. 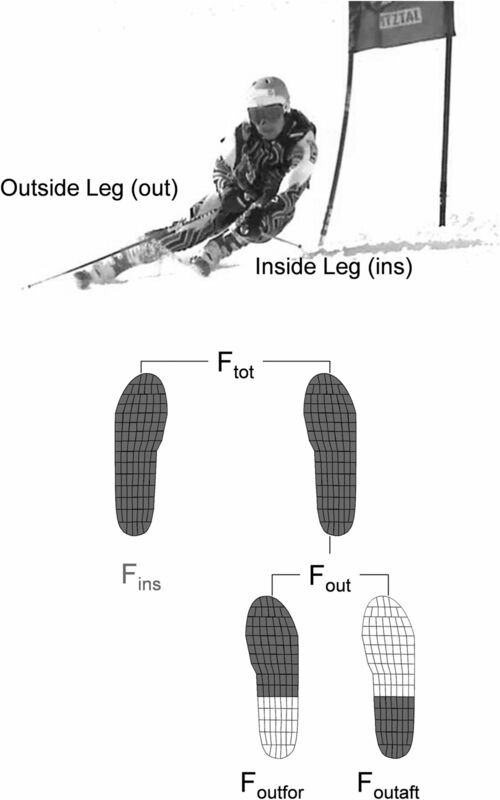 By catching the inside edge in an out-of-balance situation, a carving ski rotates inward and can produce an internal tibial torque, which was identified as ‘aggressive ski behaviour’.11 In other words, the functionally positive associated term ‘self-steering effect’ while controlled skiing,14 ,15 ,28 ,29 becomes negatively associated in the case of out-of-balance situations and is then called ‘aggressive ski behaviour’.6 ,8–10 Strictly speaking, this study explored the self-steering effect of different ski geometries in controlled skiing situations. The ski's aggressiveness, therefore, was only indirectly explored. It has to be mentioned, that an assessment of aggressiveness in out-of-balance situations is experimentally difficult to perform and ethically not justifiable since it would consciously force the athlete into a risk position of severe injury. As described from a mechanical perspective in the methods, Foutfore seems to be a reasonable measure of the self-steering effect and, therefore, an estimate of aggressive ski behaviour. The decrease in Foutfore with greater sidecut radius supports the argument above: while skiing with greater sidecut radius, the self-steering effect is less pronounced and consequently the forebody of the ski does penetrate and shear the snow less. Thus, the resulting effect of inertia in the direction of travel is reduced, the outcome of which is lower forces under the forefoot.14 ,15 ,19–21 The advantage of this approach compared to the rating of perceived aggressiveness is obvious: results are subjectively unbiased and the parameter seems to be more sensitive to the evaluation of subtle differences, since differences between the distances of the skis used also were identified (Pref↔P30<P30↔P35>P35↔P40), which was not the case for perception. Theoretical approaches usually neglect the possibility of intuitively distributing the load on both the inside and outside leg.15 ,27 ,30 Although the inside leg loading obtained attention in connection with steering a ski with small sidecut radius,29 the outside leg is still mainly responsible for steering. The inside leg is used primarily to support the outside leg; for instance, to avoid falling too far to the inside if the direction of the resultant forces do not match whole body inclination.14 Hence, it is plausible to observe the main differences of the self-steering effect on the outside leg. In the current study the greatest differences were observed with respect to this phenomenon (significant for Fout and Foutfore). An earlier study comparing the most extreme horizontal gate distances in GS concluded that as long as the course setting changes were not substantial enough, injury risk might not be reduced considerably, since athletes are still able to adapt and partly compensate by changing their timing strategy.12 In contrast, more substantial changes might leave the borders of usual technical solutions and athletes would have to adapt their skiing technique substantially. The adapted technical solutions could potentially be less attractive for the spectators. Therefore, to minimise injury risk while maintaining attractiveness are challenges for decision-makers and must be considered carefully. To our knowledge, the strategy of assessing both aspects prior to introducing the prevention measure is unique and was performed for the first time in alpine ski racing by the current study. Our results revealed that potential gains in injury prevention and the beginning of a loss of attractiveness occur on different levels of intervention: from a prevention perspective, a sidecut radius of 35 m provides substantial gain (highest distance between P30 and P35); from an attractiveness perspective, a significant loss was observed only for a 40 m sidecut radius accompanied with moderate additional reduction of injury risk compared to P35. This difference is important for the decision-makers of FIS in terms of balancing performance and injury related arguments against each other. This study explored the aggressiveness of different ski geometries while skiing a typical GS course. An ‘aggressive’ ski behaviour in out-of-balance situations is associated with a direct force transmission at the ski-snow interaction and is known to be a main risk factor for severe knee injuries in GS. The ground reaction forces under the forefoot of the outside leg seem to be an innovative and reasonable measure to quantify the aggressiveness of skis. Compared to assessing the athletes’ perceptions, the aforementioned measure is more subtle and free of subjective bias. Furthermore, data from this study showed that potential gains in injury prevention by reducing the ski's self-dynamic effect (aggressive ski behaviour in an out-of-balance situation) and the beginning of the loss of attractiveness for the spectator occur on a different level of intervention. Consequently, for the decision-makers of FIS this investigation suggested three evidence-based arguments: (1) P30: no preventative gain, no loss in attractiveness; (2) P35: substantial preventative gain, no significant loss in attractiveness; (3) P40: highest preventative gain, significant loss in attractiveness. This is the first study in alpine skiing assessing preventative gain in combination with external attractiveness prior to introducing the prevention measure. An injury prevention approach, which is discipline-specific and addresses injury specific risk factors. Decreased ski aggressiveness can be quantified by calculating ground reaction forces under the forefoot of the outside leg free of subjective bias and with greater resolution than based on subjectively perceived rating. Moderate adjustment of ski with ski length and sidecut radius has no impact on specific risk factors; but a more pronounced increase in sidecut radius does have a positive impact. The authors would like to thank Rüdiger Jahnel, Peter Scheiber, Christoph Eiter and Atle Skaardal for their on-hill support and SRS for organising the prototype production and athlete recruitment.
. Ultimate skiing. Leeds, UK: Human Kinetics, 2010:212.
. The new skiing mechanics. 2nd edn. Waterford: McIntire Publishing, 2001.
International Ski Federation FIS. Specification for competition equipment and comercial markings. Edition 2007/08 ed. Oberhofen, Switzerland: Self-publisher, 2007.
International Ski Federation FIS. Specification for competition equipment and comercial markings. Edition 2011/12 ed. Oberhofen, Switzerland: Self-publisher, 2011.
International Ski Federation FIS. Specification for competition equipment and comercial markings. Edition 2012/13 ed. Oberhofen, Switzerland: Self-publisher, 2012.
. Mechanics of the turning snow ski. In: Johnson RJ, Mote CD, eds. Skiing trauma and safety: fifth international symposium. Philadelphia: PA: American Society for Testing and Materials, 1985:117–40.
. A Kinematic and Kinetic Study of Alpine Skiing Technique in Slalom (PhD Thesis). Dissertation, ISBN Nr. 978–82–502-0440-9. Oslo: Norwegian School of Sport Sciences, 2010.
. A comparison of ground reaction forces determined by portable force-plate and pressure-insole systems in alpine skiing. J Sport Sci Med 2011;10:754–62.
. Carving—biomechanische Aspekte bei der Verwendung stark taillierter Skier und erhöhter Standflächen im alpinen Skisport. Leistungssport 1999;1:39–44.
. Line characteristics and performance in giant slalom. In: Müller E, Lindinger S, Stöggl T, et al. eds. 5th int. congress on science and skiing; 14.-19. December 2012; Austria: St.Christoph, 2010:57.
International Ski Federation FIS. Specification for competition equipment and comercial markings. Edition 2003/04 ed. Oberhofen, Switzerland: Self-publisher, 2003. Contributors JK, JS and EM conceptualised the study design. JK organised and coordinated the biomechanical field study. JK, JS, MG contributed to the data collection. JK, supported by JS and MG conducted the data processing and analysis. All authors contributed the intellectual content of the study, manuscript writing and approved the final version of this article. Funding This study was financially supported by the International Ski Federation (FIS). Ethics approval This study was approved by the Ethics Committee of the Department of Sport Science and Kinesiology at the University of Salzburg.